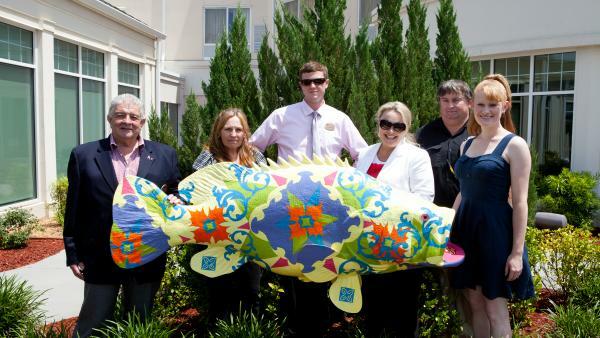 The Hilton Garden Inn released their rockfish “Connie,” in honor of Conrad Hilton. The fish, designed and painted by Leary Davis of Virginia, is a beautiful and elegant quilt-like pattern of pastels with the Hilton logo incorporated into the design. Davis, a graduate of Longwood University with a degree in Music Voice Performance, said she was inspired by a coloring page design in a book from her childhood. The Hilton Garden Inn has 147 rooms, including specialty balcony and Jacuzzi suites. Each room offers a microwave and refrigerator. Other amenities include an indoor pool and spa, fitness center, business center, free high speed internet and function space that can accommodate 100 people. The on-site restaurant, the Great American Grill, serves breakfast and dinner and the lounge opens at 5 p.m. and has a dinner menu. Both are open to hotel guests and the public, seven days a week. Planning a family reunion or having out-of-town guests for the weekend? The Hilton Garden Inn of Roanoke Rapids is ideal.